A ball of yarn is full of possibilities. It is formless. It doesn’t yet have a shape. In a way it is empty…but not the kind of emptiness that is sad and hollow, but emptiness like a blank page. I love a blank page – unless I really need to have words on it for a deadline – the blank page is empty, but the emptiness is an emptiness of opportunity. The emptiness is a blank canvas where anything is still possible. When I look at this ball of yarn, I think about creation. Genesis 1 says, “In the beginning when God created the heavens and the earth, the earth was a formless void and darkness covered the face of the deep, while a wind from God swept over the face of the waters.” The earth was a formless void, but not a formless void of despair. The earth was a formless void of possibilities. That which had not yet been created was a formless void of hope. Before God created the world, the world was formless with possibility and hope. After the fall, Paul writes that “creation was subjected to futility.” The word that is translated “futility” could also be translated as “vanity” or “emptiness.” Creation, which had once been a formless void of hope was created into something very good, and then returned to formless emptiness – but this time, a formlessness of loss. This isn’t the emptiness of possibility, this is the emptiness of deep grief. Have you ever put together a jigsaw puzzle? My two favorite parts of putting together a puzzle are: opening the box and seeing all the pieces, and the moment when the final piece is put in place. When the box is first opened, all the pieces are there and the possibility of the finished product is fresh and new. When the final piece is put in place, the picture suddenly makes sense. Do you know what my least favorite part of putting together a puzzle is? Having to take it apart again. All of that work. All of that time. All of that searching for just the right piece for just the right place…and now it all has to be undone. It’s like a ball of yarn. On the one hand there is new yarn, a fresh skein filled with possibilities. On the other hand, there are projects I have started and then had to tear out. Tearing it out is called “frogging,” as we yarn people like to say. When you frog a project, you “rip it, rip it, rip it out.” Crocheting something feels beautiful. It feels like putting together a dream. It’s like making order out of chaos. But, tearing work apart…it gets to me. You knew what was there before. You know what the possibilities had been. And then it all gets unraveled. This Sunday in the season of Advent is traditionally set aside as a Sunday of hope, and Romans 8 has a whole lot to say about what it means to have hope. Hope is more than a positive emotion. Hope is more than just optimism. Hope is something inside of us, something that we hang onto even if we don’t know why. This past week, I learned that the word “hope” and the word “wait” come from the same root word in Hebrew. Hoping and waiting go hand in hand. But, I also learned that the word “hope” comes from the same root word as the word for “rope” or “cord.” Just like in the passage where Rahab hangs up a crimson cord for the spies. The word “cord” is the same word as the word for “hope.” Hope literally throws us a rope when we most need it. 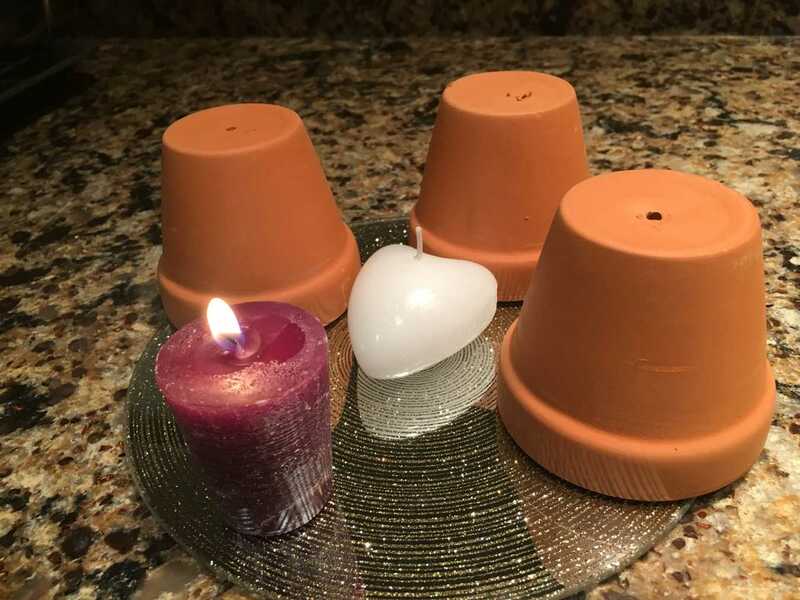 For many, Advent is not a time of joy – it is a reminder of sorrow, or loss, or deep hurt. And when we approach the Advent wreath and light the candles and talk about hope, sometimes a happy hope is the furthest thing from our reality. Romans 8 challenges us to take a look at the created world – a world which hopes against hope, and longs for redemption and renewal. Verses 18-19 say this: “I consider that the sufferings of this present time are not worth comparing with the glory about the be revealed to us. For the creation waits with eager longing for the revealing of the children of God.” The creation waits with eager longing. The word that is translated as “eager longing” is a challenging and beautiful word. It literally means “the head outstretched.” This kind of waiting and expectation isn’t easy. It’s a stretching; it is a reaching beyond ourselves. The world waits with its head outstretched. And the only other time this word is used in Scripture, it is used hand-in-hand with hope. Hope and eager longing go hand in hand. Waiting, being stretched, longing…these are what it means to have hope. This Advent, we are challenged to wait with our heads outstretched as well – and not just our heads, but our hands and our hearts, too. Perhaps we’ve had a difficult season up to this point, or perhaps the month of December is a month we just try to get through. Perhaps you feel more like a bulb planted deep under the ground than a vibrant flower turned towards the sun. Even when we don’t feel optimistic, even when we don’t feel joyful, even when we don’t feel like there’s a whole lot of good while we wait – we can still have hope, because in that bulb, there is the flower – as the hymn goes. Today, whether you feel like a ball of yarn filled with the hopefulness of promise, or whether you feel as though everything has just been unraveled, Jesus offers us the cord of hope. Jesus stretches it out to us and invites us to take hold of it – and he promises to hold onto it with us. Our passage from Romans 8 continues: “For in hope we were saved. Now hope that is seen is not hope. For who hopes for what is seen? But if we hope for what we do not see, we wait for it with patience.” I’m not a pro at waiting with patience, but there is something about waiting that is all about hope. We wait because something – someone! – is coming. We wait because all things are going to be made new. We wait because that formless, empty, void of vanity is going to be restored into something even better than it was before. On this first Sunday of Advent, Jesus extends to us the cord of hope – because our hope is in Christ, and our hope connects us to Christ. Today, we are invited to imagine this unraveled pile of yarn that is the unraveled bits of our lives being reconnected to the one who can put it all back together. Last year, I received a manual yarn ball winder as a Christmas gift, and it reminds me a lot of what hope is like. You take a loose end of yarn, and you connect it to the winder. And as you wind the crank, the messy, unraveled, sad pile of yarn begins to be put back together into something useful. Sometimes the yarn tangles as it is being wound back up, but in those moments, you stop winding and start untangling. Sometimes the knots are so bad that I have to ask for help – from my husband or my kids, or whomever else might be willing to lend a hand, and then back to winding again. Our Lord – the one we so wait for and long for – extended to us the cord of hope by coming into the world to walk among us, to show us God’s love, and to help us pick up the tangled pieces of our unraveled relationship to God. Our Lord – the one we so wait for and long for – is here with us, picking us up, reconnecting us to the center, and winding us back up. Do we wait with outstretched heads, and hands, and hearts to receive? We gather as a community to worship – in word and in prayer and in song. We also gather as a community to worship by approaching the Table where Jesus is the host. He feeds us freely, regardless of whether we are overflowing with joy or feeling unraveled by the strains and stresses of life. He feeds us – asking nothing of us in return, though open hands on our part certainly helps. Today, as we look for hope…we are invited to come and to feast and to be reconnected to the one who will put us back together.